Manufacturing town in Yorkshire, England. It possessed a small Jewish community before the year 1840, divine service being held in a small room in Bridge street, little better than a loft, access to which was gained by means of a ladder. On May 12, 1840, a plot of land in the Gelderd road was granted by the Earl of Cardigan for a cemetery, which plot was afterward enlarged, and now belongs to the Old Hebrew Congregation (the "Great Synagogue") in Belgrave street. 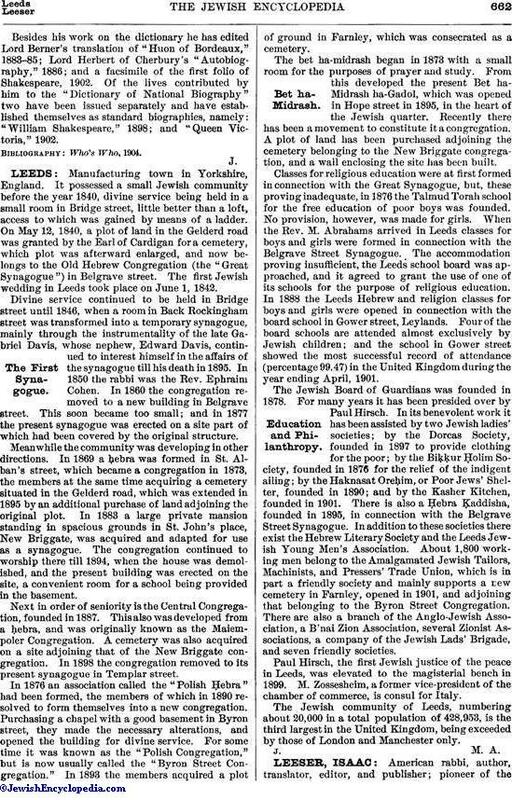 The first Jewish wedding in Leeds took place on June 1, 1842. Divine service continued to be held in Bridge street until 1846, when a room in Back Rockingham street was transformed into a temporary synagogue, mainly through the instrumentality of the late Gabriel Davis, whose nephew, Edward Davis, continued to interest himself in the affairs of the synagogue till his death in 1895. In 1850 the rabbi was the Rev. Ephraim Cohen. In 1860 the congregation removed to a new building in Belgrave street. This soon became too small; and in 1877 the present synagogue was erected on a site part of which had been covered by the original structure. Meanwhile the community was developing in other directions. In 1869 a ḥebra was formed in St. Alban's street, which became a congregation in 1873, the members at the same time acquiring a cemetery situated in the Gelderd road, which was extended in 1895 by an additional purchase of land adjoining the original plot. In 1883 a large private mansion standing in spacious grounds in St. John's place, New Briggate, was acquired and adapted for use as a synagogue. The congregation continued to worship there till 1894, when the house was demolished, and the present building was erected on the site, a convenient room for a school being provided in the basement. Next in order of seniority is the Central Congregation, founded in 1887. This also was developed from a ḥebra, and was originally known as the Maiempoler Congregation. A cemetery was also acquired on a site adjoining that of the New Briggate congregation. In 1898 the congregation removed to its present synagogue in Templar street. In 1876 an association called the "Polish Ḥebra" had been formed, the members of which in 1890 resolved to form themselves into a new congregation. Purchasing a chapel with a good basement in Byron street, they made the necessary alterations, and opened the building for divine service. For some time it was known as the "Polish Congregation," but is now usually called the "Byron Street Congregation." In 1893 the members acquired a plot of ground in Farnley, which was consecrated as a cemetery. The bet ha-midrash began in 1873 with a small room for the purposes of prayer and study. From this developed the present Bet ha-Midrash ha-Gadol, which was opened in Hope street in 1895, in the heart of the Jewish quarter. Recently there has been a movement to constitute it a congregation. A plot of land has been purchased adjoining the cemetery belonging to the New Briggate congregation, and a wall enclosing the site has been built. Classes for religious education were at first formed in connection with the Great Synagogue, but, these proving inadequate, in 1876 the Talmud Torah school for the free education of poor boys was founded. No provision, however, was made for girls. When the Rev. M. Abrahams arrived in Leeds classes for boys and girls were formed in connection with the Belgrave Street Synagogue. The accommodation proving insufficient, the Leeds school board was approached, and it agreed to grant the use of one of its schools for the purpose of religious education. In 1888 the Leeds Hebrew and religion classes for boys and girls were opened in connection with the board school in Gower street, Leylands. Four of the board schools are attended almost exclusively by Jewish children; and the school in Gower street showed the most successful record of attendance (percentage 99.47) in the United Kingdom during the year ending April, 1901. The Jewish Board of Guardians was founded in 1878. For many years it has been presided over by Paul Hirsch. In its benevolent work it has been assisted by two Jewish ladies' societies; by the Dorcas Society, founded in 1897 to provide clothing for the poor; by the Biḳḳur Ḥolim Society, founded in 1876 for the relief of the indigent ailing; by the Haknasat Oreḥim, or Poor Jews' Shelter, founded in 1890; and by the Kasher Kitchen, founded in 1901. There is also a Ḥebra Ḳaddisha, founded in 1895, in connection with the Belgrave Street Synagogue. In addition to these societies there exist the Hebrew Literary Society and the Leeds Jewish Young Men's Association. About 1,800 working men belong to the Amalgamated Jewish Tailors, Machinists, and Pressers' Trade Union, which is in part a friendly society and mainly supports a new cemetery in Farnley, opened in 1901, and adjoining that belonging to the Byron Street Congregation. There are also a branch of the Anglo-Jewish Association, a B'nai Zion Association, several Zionist Associations, a company of the Jewish Lads' Brigade, and seven friendly societies. Paul Hirsch, the first Jewish justice of the peace in Leeds, was elevated to the magisterial bench in 1899. M. Zossesheim, a former vice-president of the chamber of commerce, is consul for Italy. The Jewish community of Leeds, numbering about 20,000 in a total population of 428,953, is the third largest in the United Kingdom, being exceeded by those of London and Manchester only.